You first need a shopware shop. The shop and the backend must be accessible from the outside. next to your existing users to view the configuration. In the user profile you can now find the user name and the API key. It is important that API access is also active. If not, check the box next to Enable. In reybex, choose the transaction Marketplace Setup Wizard [OMP06]. Here you configure your different marketplace connections. Click on the Available Shops tab > choose Shopware. 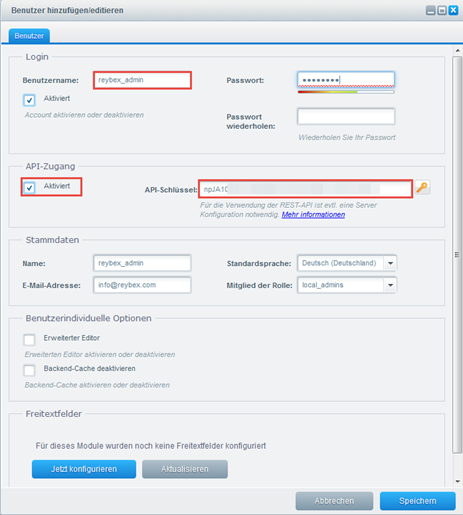 Enter a reybex internal name for the online shop > enter the URL to the online shop in the Endpoint Url field > enter the Username of the Shopware user you have set up in Shopware > Copy the API key from the user profile into Shopware and enter it into the field API Key in reybex. Click the Active checkbox to activate the connection between Shopware and reybex. Click the Read only checkbox to prevent resynchronisation from reybex to your Shopware shop. In the last step of the wizard you import your Shopware categories to reybex.